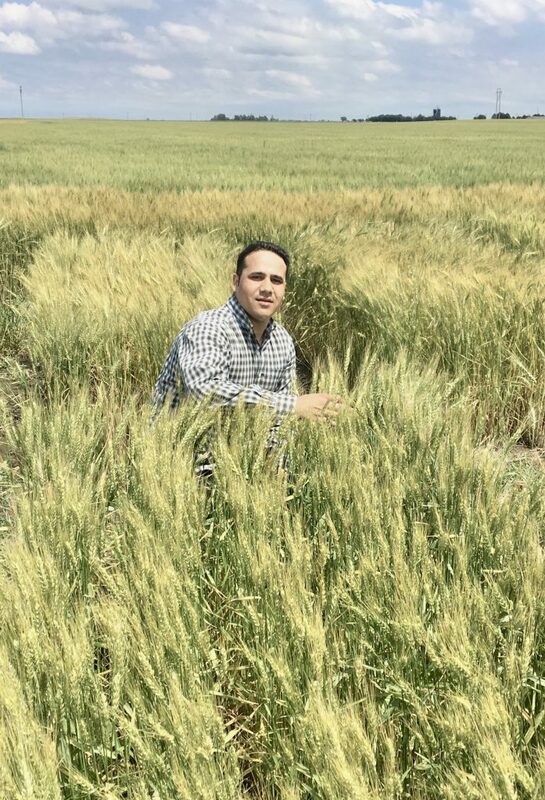 This profile of PhD student and visiting CIMMYT-Turkey researcher Madhav Bhatta, by Emma Orchardson was originally posted on InSide CIMMYT. Madhav Bhatta at a IWWIP testing site in Turkey. Wheat is one of the world’s most widely grown cereal crops. Global production between 2017 and 2018 exceeded 700 million tons and fed more than one third of the world’s population. Based on the current rate of population increase, cereal production will need to increase by at least 50 percent by 2030. However, biotic and abiotic stresses such as crop diseases and drought continue to place significant constraints on agricultural production and productivity. Global wheat yield losses due to diseases such as wheat rust have been estimated at up to $5 billion per year since the 1990s, and rising temperatures are thought to reduce wheat production in developing countries by up to 30 percent. 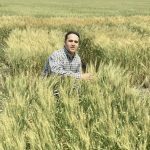 In his recently completed a PhD project, Bhatta focused on the identification of genes and genomic regions controlling resistance to biotic and abiotic stresses in synthetic hexaploid wheat, that is, wheat created from crossing modern wheat with its ancient grass relatives. His research used rich genetic resources from synthetic wheat to identify superior primary synthetics possessing resistance to multiple stresses. It also aimed to identify the respective genes and molecular markers that can be used for market-assisted transfer of the genes into high-yielding modern wheat germplasm. Working under the joint supervision of Stephen Baenziger, University of Nebraska-Lincoln, and Alexey Morgounov, CIMMYT, Bhatta spent two consecutive summers conducting field research at various research sites across Turkey. The research was conducted within the framework of the International Winter Wheat Improvement Program (Turkey-CIMMYT-ICARDA). Over the course of six months, he evaluated 126 unique synthetic wheat lines developed from two introgression programs, which he selected for their genetic diversity. Bhatta and his collaborators recommended 17 synthetic lines that were resistant to more than five stresses, including rusts, and had a large number of favorable alleles for their use in breeding programs. They also recommended 29 common bunt resistant lines, seven high yielding drought tolerant lines, and 13 lines with a high concentration of beneficial minerals such as iron and zinc and low cadmium concentration. Madhav Bhatta completed his PhD in Plant Breeding and Genetics at the University of Nebraska-Lincoln, where he was a Monsanto Beachell-Borlaug International Scholar. He is now based at the University of Wisconsin-Madison, USA, where he recently began a postdoctoral research position in the Cereal Breeding and Genetics program. He is currently working on optimizing genomic selection models for cereal breeding programs and he looks forward to future collaborations with both public and private institutions. The seeds of the superior synthetics are now available from CIMMYT-Turkey. For more information, contact Alexey Morgounov (a.morgounov@cgiar.org). Bhatta M., P.S. Baenizger, B. Waters, R. Poudel, V. Belamkar, J. Poland, and A. Morgounov. 2018. Genome-Wide Association Study Reveals Novel Genomic Regions Associated with 10 Grain Minerals in Synthetic Hexaploid Wheat. International Journal of Molecular Sciences, 19 (10), 3237. Bhatta M., A. Morgounov, V. Belamkar, A. Yorgancilar, and P.S. Baenziger. 2018. Genome-Wide Association Study Reveals Favorable Alleles Associated with Common Bunt Resistance in Synthetic Hexaploid Wheat. Euphytica 214 (11). 200. Bhatta M, A. Morgounov, V. Belamkar, and P. S. Baenziger. 2018. Genome-Wide Association Study Reveals Novel Genomic Regions for Grain Yield and Yield-Related Traits in Drought-Stressed Synthetic Hexaploid Wheat. International Journal of Molecular Sciences, 19 (10), 591. Bhatta M, A. Morgounov, V. Belamkar, J. Poland, and P. S. Baenziger. 2018. Unlocking the Novel Genetic Diversity and Population Structure of Synthetic Hexaploid Wheat. BMC Genomics, 19:591. https://doi.org/10.1186/s12864-018-4969-2. Morgunov A., A. Abugalieva, A. Akan, B. Akın, P.S. Baenziger, M. Bhatta et al. 2018. High-yielding Winter Synthetic Hexaploid Wheats Resistant to Multiple Diseases and Pests. Plant genetic resources, 16(3): 273-278.